How do you feel about climbing at the 'Indian Creek' of Mexico? Cascada la Concepción is an exquisite basalt waterfall fed by the Río Ñadó. 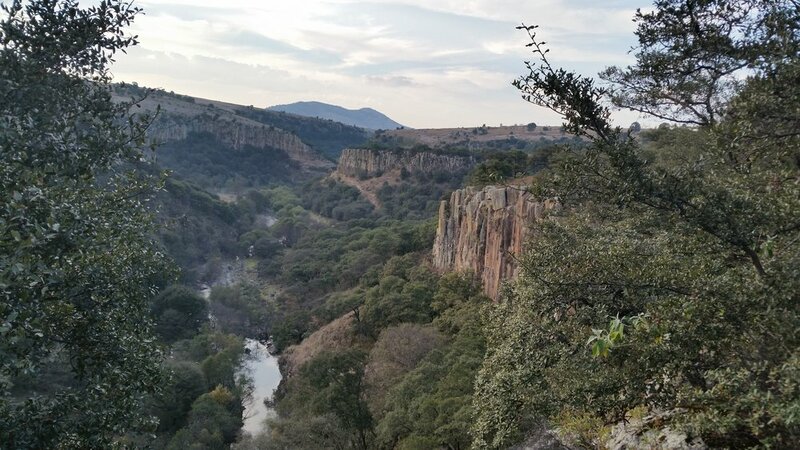 The cliffs we climb line both sides of the river as it winds its way through the countryside to eventually feed into La Presa Tepozan. Basalt is a term derived from the Latin term ‘basaltes’, meaning “very hard stone”, and a very hard stone it is. The basalt lining this river valley has a collection of some of the greatest crack climbs in Mexico (possibly the entire northern continent). What really makes the climbing special in this oaken valley is the vesicular texture of this particular basalt stone. The rock is hard, but very smooth on the skin. It is a paradise for the fine crack connoisseur. Aculco (as it is known to the locals) is so rich in history that the only way to try to explain the nature of this beautiful town is to direct you to click the link above and read for yourself. If you like fine wine, fresh cheese, warm pastries, or homemade ice cream, this town is absolutely for you. If you climb an eight hour day with us at La Cascada you can eat all of the treats above, all day, all night long. During your rest days it is possible to walk the town and admire the architecture that dates back to 1540 (while eating pastries). It is also possible to have an “active” rest day hiking Peña de ÑADÓ (eating more pastries). This granite outcropping is visible from La Cascada and summits at 11,500 feet. The town is impeccable, and the hiking unforgettable.